Sometimes we learn lessons from even the most ridiculous of places. Case in point, from viewing Attack on Titan, I learned that the speed at which one watches something can greatly affect how one perceives it. 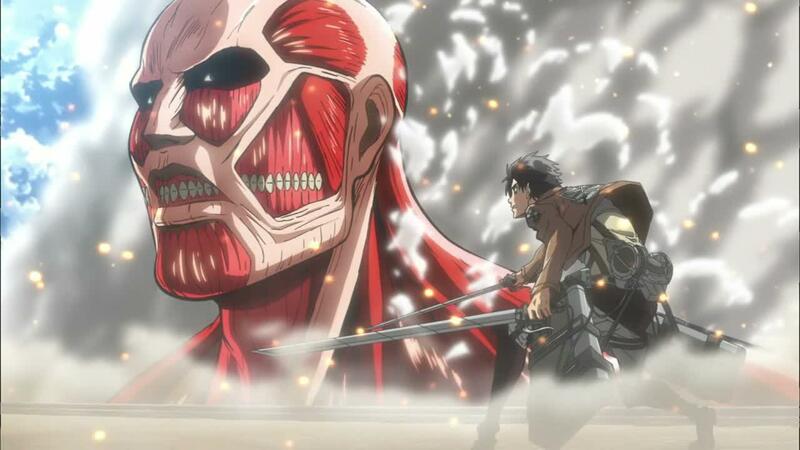 Attack on Titan was 2013’s big thing in anime. Even though I was out of the loop up until Aku no Hana, even I couldn’t avoid seeing OP parodies and references popping up in my Touhou related things and in my youtube feeds. So, having run out of things to consume this summer, I decided to give it a go, but did it live up to it’s hype? Before I go into my thoughts on the show, I should tell you of two biases that I received prior to viewing Attack on Titan. One was my brother and his group of friends. Generally, they are pretty good at spotting things that I will end up liking and to a man, they were gushing about AoT while it was airing. I was told several times that I simply must watch it, darling. The second bias was another friend who has been trashing the show up until the present day. Any time someone would bring up AoT there would be heavy eye rolling and perhaps even a long rant about how terrible the plot and characterization was. Given these two extremes, I figured that AoT must be doing something right.. right? The whole premise of Attack on Titan is that humanity has been reduced to a tiny population of around one million who all live within a walled country. This country has three walls which keep at bay the titans, essentially giants, who live for nothing more than to kill and eat humans. They have but one weak spot, these titans, and that is a spot on the backs of their necks which can be attacked by use of 3-D maneuver gear (shooty-wire belts). At the start of the show, a colossal titan, never before seen, breaks through the first wall and the breach causes a massive die off of humans. 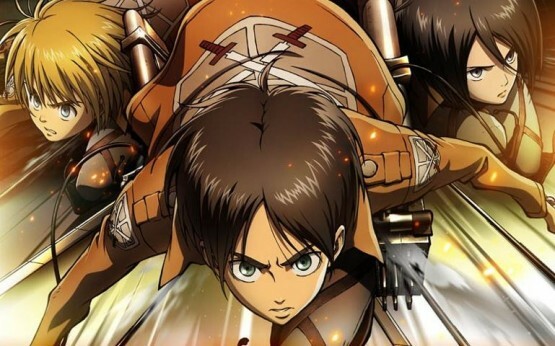 Our hero Eren and his friends Mikasa and Armin, survive the initial assault and train to be soldiers against the titans, all while knowing that the secrets to the titans’ existence may lie in the basement of Eren’s fathers house. Insert war, crazy twists, and lots and lots of death. Within five episodes we go from the calm peaceful village that the three kids grow up in to their graduation from the training corps and all the horrific stuff they’ve been through up to that point. It goes by pretty quick and gets us to the plot fairly quickly. However, for some, this is where the problems start. As soon as the training corps encounter their first real battle, some major stuff goes down, stuff that instantly changes the direction the show goes in. However, two episodes later, it’s all undone, so to speak. This is one of those things my friend ranted about, and I would agree with him, that leaving the original thing as it was would have been a really cool thing to do story-wise. That is, if the undoing weren’t the entire plot of the show. The thing is that Eren gets killed and then comes back as a strange, self-aware titan. My friend would be completely right, that killing off your main character up to this point would be amazing in a show about war and how no one is safe. But, his becoming a titan at will is the crux of the entire Attack on Titan franchise. There would be no progression without it. 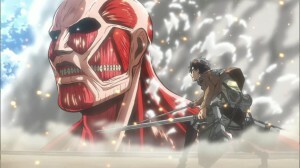 Could we have had Eren die and have some other character be the titan, sure. Maybe that would have been crazier and more bold, but what we got was fine, I think. The characterization also needs a lot of work, in my opinion. Most characters is extremely one-dimensional. Eren wants vengeance and he has determination as you can tell by his never faltering decibel level. Mikasa is the loner girl who has attached herself as a big-sister to Eren and is amazing at combat. Armin is a coward, but is really smart. Apparently, most people who took issue with the did so because they saw Mikasa shift from being a big-sister to being secretly infatuated with her brother. For me, this never materialized and she didn’t change at all from beginning to end. The only real changes were from Armin, who gains better mastery of himself. Overall, the show is ok. It does a great deal in showing the horrors of war effectively, but not doing a good job of getting us to care about the people in them. It does an amazing job of world building, but puts out bread crumbs it has no intention of leading anywhere. And the ending is just a mess of questions leading to questions leading to questions, none of which are answered. Maybe in season two, but not here. However, the most interesting thing about the show was not its contents (except maybe its OP1), but in how it was paced. When I watched Attack on Titan, I did so at my leisure, marathoning some bits, staggering others. In all, it took about a week to watch it and in that mode I felt it was extremely well paced for what it was trying to convey. Some bits were drawn out, some were very short, as all wars are. The characters changed at a good pace as well, maybe not as much as I would have liked, but for what their end result was the rate and direction of change was not out of the question. The same could not be said for those who watched it one episode per week. My ranting friend and his mates all watched it this way and I can see where their frustrations come from. Many episodes serve only to link two others together, as a way of getting the characters from here to there, which is odd given the first few episodes’ willingness to jump over huge swathes of time to get to the bits that matter. I can also see where they take issue with the plot twists. With weeks between the main event and its undoing, there is a lot of time to digest and let settle the idea that “yes, this thing has happened.” To have it then undone could feel like a kind of betrayal. The same with Mikasa’s supposed change from sister to secretly pining lover. If marathoned, Mikasa doesn’t change, but if you have six months worth of time to sit and ponder her character, it’s not a leap to start thinking that the old-familiar trope has worked its way into Mikasa’s mind. So would I recommend Attack on Titan? Yes, so long as you marathon it and realize there’s more out there than this first season.